The global economic outlook has shifted markedly in the three months since our last report. While our baseline forecast has changed only modestly, upside risks to growth have increased significantly and we no longer judge risks to be skewed to the downside. 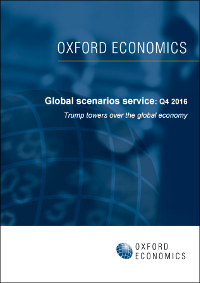 As highlighted in the latest Oxford Economics Global Risk Survey, the greatest source of risk is the US policy stance once President-elect Trump takes office.